How to make android application for android 6 in xamarin. 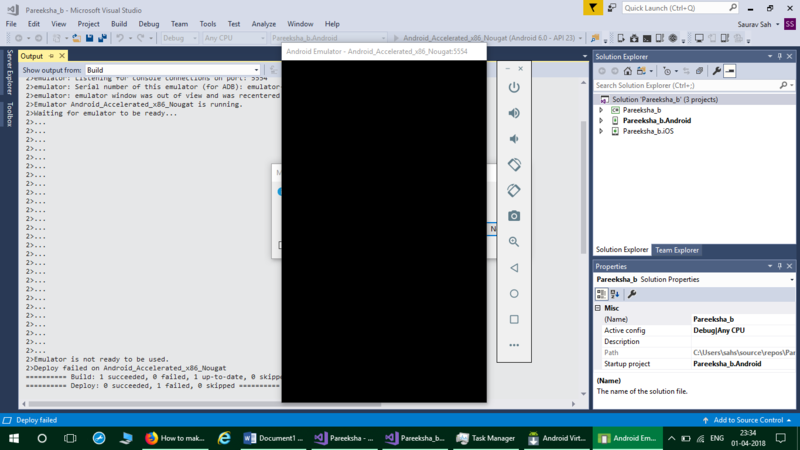 I tried all the possible option but not able to make a application in xamarin that can run on android 6. Android 6 i refer here as the target version of the xamarin application should be android 6. I repeat i don't want to make applications for android 7 or 8 . i need to make application for android 6. Anyone please let me know if you know this else i may have to learn android studio which i don't like as i am a .Net Developer. What problems are you having? What happens when you target Android 6? it hungs in between. The application is not deployed. What happens if you target 7 or 8? Anything in the application output or build output when it hangs? Having said that, the error message is fairly clear. The emulator is not ready. What happens if you try starting up the emulator separately and give it time to complete startup? I suspect there's just a problem with the Android 6 emulator. Do you have a physical android 6 device to which you can deploy?